In an new story on iHealthbeat, Barriers Continue To Limit Patient Access to Electronic Health Data, I am quoted on the topic Basically, I continue to be disappointed on the slow adoption of PHRs and the fact that Google Health is now gone. My statement at the end of the article is the most significant – how can providers strategically use PHRs as chronic disease management tools? There have been some pilot programs on this. Perhaps with the incentives to prevent readmissions and management of patients to reduce costs, such as, the Medical Home and ACOs, some provider groups will take a second look at PHRs. At the same time, I wonder if mobile apps, which have seen huge adoption, need integration with PHRs or visa versa. Disease management and wellness activities could be tracked through apps and added to one’s PHR. This what Google Health tried to do and HealthVault still does. Yet only a small percentage of those with chronic or life threatening illnesses have benefited. In a radio interview from Inside the Media, Hugo Campos, an e-Patient with an implanted defibrillator (ICD), talked about his desire to have the data from his device. His logical argument is that the device is now part of his body and so he should have the right to the data from the device. So far he has been unsuccessful in getting his provider or the manufacturer to assist him with this. While rights to one’s own health data is becoming a reality through the Affordable Care Act and Meaningful Use and through initiatives like the Blue Button, device data is new territory. One could argue that the data is too complex for the lay person to analyze but that is the same argument which was made not so long ago about medical records in general. With the growth of apps and health information on the web, complex medical data is becoming more accessible. This new territory needs more discussion. See the comments on the podcast page. Also, you can follow Hugo on the ICD Users blog. This is the topic of my new blog post on HealthWorks Collective. Already received lots of traffic on Twitter and lots of views. 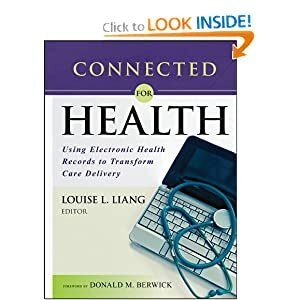 Would like to see more about mobile standards in health care from Motorcycle Guy and others. Adoption of PHRs – Where are we going? From ComputerWorld -Consumers remain wary of personal health records – reporting on the IDC survey which shows that 23.4% reported that they were somewhat comfortable or very comfortable with Google or Microsoft collecting their health information. 28% of the respondents indicated that they would use a PHR system if their physician recommended doing so. 10% indicated that they did not use one because of infrequent need for medical care and 10% indicated they did not trust the security of Internet sites. 2) features such as the ability to securely email physicians, pay bills, refill prescriptions, get specialist referrals and make appointments, that is PHRs tethered to EHRs will be the consumer’s preference. He also sees a future opportunity to integrate personal genomics into PHRs. He talks about his own experience with personal genomics. Based on these two articles, there is reason for optimism about growth in adoption of PHRs but may be conservative growth. Drivers of that growth will be: recommendation by providers (participatory medicine), tethered to an EHR so much of the data is already there, and being future rich. Two additional features I think will be useful for patients are: connection with social media (such as, sharing one’s data selectively with private disease and condition communities, such as, organizedwisdom.com or patientslikeme.com) and connection with wellness apps and mobile devices both of which are offered by Google Health and Microsoft HealthVault). April 4 in Maastricht, Netherlands, was an event full of optimism but not simply about how technology can transform healthcare. Lucien Engelen envisioned this conference as about health, not healthcare and full participation by the patient as an equal partner. To what extent was this accomplished? Although these quotes may not be exact or make up a coherent whole, the point is that creative optimism gouged by new, openly available technology like social media, can be transformational now. This was no less true than the patient stories heard throughout the day of facing disease but triumphing over it through community (often online) and hope. As I process this event, watch for more posts on these themes. In additional, new partnerships round out the offering: Fitbit, Cardiotrainer, and WorkSmartLabs. So it appears that in lieu of making Google Health a mobile app itself, they have partnered with mobile app developers particularly around wellness and exercise. Although Google Health displays well on an iPad browser in landscape view. Three new provider partnerships are announced as well, Lucile Packard Children’s Hospital at Stanford, University of Pittsburgh Medical Center (UPMC) and Sharp HealthCare. Look forward to hearing more about these and how they are encouraging the use of Google Health. UPMC is an Epic shop with MyChart. The announcement has led to lots of buzz in blogs and twitter including “Google Health Unbound: Can It Overcome Indifference to Personal Health Records?” and Google Health Takes a Big Step Forward by Dr. Dean Ornish on Huffington Post.